A delightful 3 bedroom mudbrick cottage amid the rolling vista of the southern highlands. Please see our gallery photos. Located in Erith St just over 1k from the Pub and Railway station, near all services and some great local restaurants. Main bedroom Queen Bed, 2 other bedrooms each have 2 Single Beds. Glass fronted pedestal gas log fireplace, stained glass windows, garden, bird life large lawns. Full modern kitchen with dishwasher bathroom with a bath and shower over. Full linen supplied for a small extra charge. Our Place now has a Pixie Nespresso with matching cups and a display case of capsules. Capsules are $1 each on an honour system (leave your money in the pig). - SPRING - Glorious birdsong. Open gardens bursting with perfume or cycling or bush walking in Morton National Park 2 km away. - SUMMER Go for an early walk or take your cossies and towels just 500m for the local public pool (its heated) Look out at night for wombats! - AUTUMN - a gentle chill colourful trees. Harvest time, the grapes in the local vineyards swell. Season of mellow fruitfulness. In April Bundanoon is Brigadoon. - WINTER - bright sunny days with clean crisp air. Lazy long warm in wonderful local pubs, snuggle up and watch the crackling flame s in wood combustion fire at night. - LADIES GETAWAY - Aromatherapy + beauty on site. Cosy comfortable cottage in a great location. The cottage was great for our family of 4. Plenty of space, out door fire pit, clean and well equipped. Very comfortable in winter. You are welcome any time! Cosy weekend getaway. Easy walk to town or hotel. Everything we needed. We thoroughly enjoyed our stay as usual. The property is excellently located for the Brigadoon festival which is the reason for our visit. The only points for improvement were that we couldn't find a kettle and there were no instructions to operate the oven or the TV/DVD. house which my Uncle & Aunt built. I really thought it was so good to see it largely unchanged, yet still very clean and in a great state. good that the place was in such good condition and being looked after. The fire had been set for us - we just needed to light it. The house had everything we needed and more. It is so handy to everything, the kids loved the croquet and the WOMBAT!!! 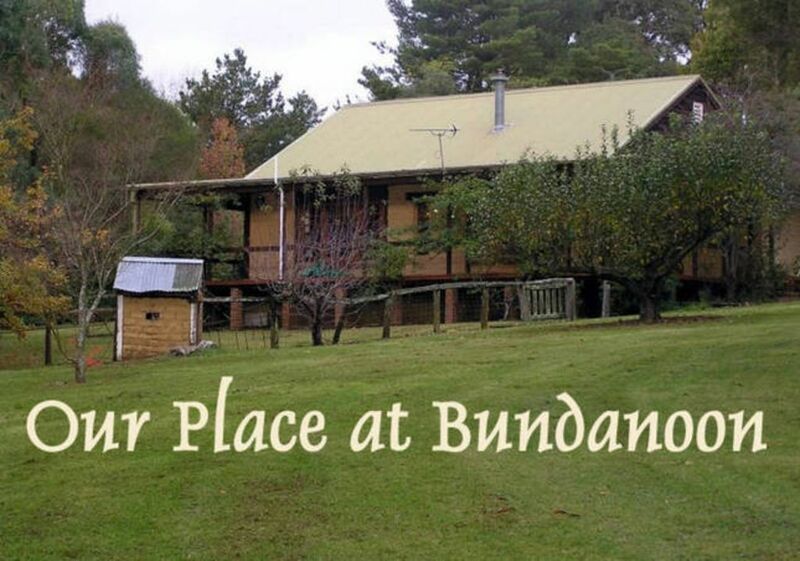 Our group of friends congregated here for the Brigadoon is Bundanoon weekend. It was a wonderful setting for a getaway weekend with every need thoughtfully catered for. Highly recommended !